Get Expert Help with Flat Pack Furniture Assembly in London! Does the idea of poor construction diagrams, missing pieces and wonky assembly leave you feeling frustrated? 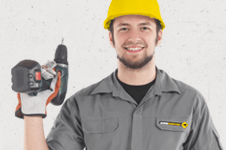 If so, look no further than Emergency Handyman to secure a fast and efficient service for furniture assembly in London. We work with flat pack and disassembled furniture from all of the big retailers… IKEA, Argos, B&Q, and many others, so we’ll be able to take care of whatever it is that you need to put together. Whether you’ve just moved house or you’ve just treated yourself to something new, we’ll leave your fee to enjoy the final product without any of the associated hassle! London furniture assembly is easy for our experienced team. If it’s a piece of flat pack furniture you can rest assured that our team will have assembled it, or something exactly like it, a thousand times before. There’ll be no need to endlessly consult instructions trying to figure out which bit goes where – our team know everything there is to know about furniture assembly, and childproofing too! We Conduct Efficient Flat Pack Furniture Assembly in London! 24/7 customer care: our customer support options are available 24 hours a day, 7 days a week, so it’s always a good time to call! A range of timetabling options: arrange for your appointment to occur at any time, from early in the morning to late in the evening… even at the weekend! Solid reviews: our testimonials demonstrate the great service our team provides. Check them out now, over on our reviews page! Contact us now - on 020 3746 0607 - when you need assistance with London baby proofing or furniture assembly of any kind. We offer free, no-obligation quotes on all of our services so you'll know exactly what you're going to pay right from the off! You can also contact us via our online booking form, or by using the instant web chat support feature on this website. We have a trained customer care team who keep our lines open and fully staffed 24/7, so feel free to reach us at any time, whether it's to ask a question, or to get that all-important free quote. In addition to our expertise with furniture assembly in London we're also ideally positioned to help you with a whole range of other household situations. We have great services for plumbing, tiling, grouting and re-sealing and a whole lot more! 2014 - 2019 © Emergency Handyman London | All Rights Reserved.